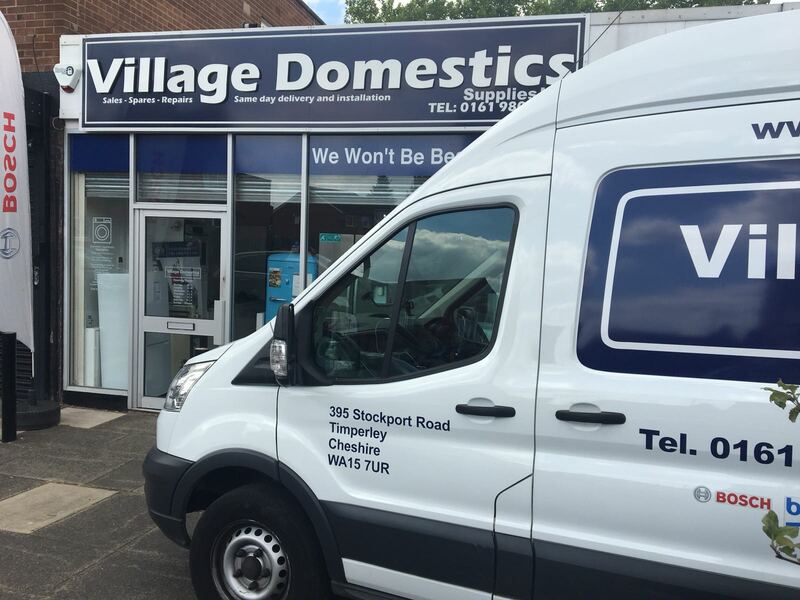 Here at Village Domestics our engineers for repairs has over 30 years’ experience repairing washing machines, tumble dryers, dishwashers ovens, cookers, cooker hoods, electric hobs fridge freezers – on both freestanding and built-in models. 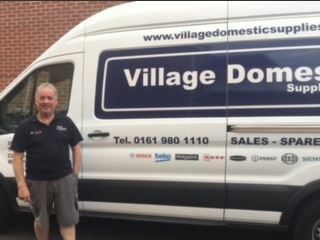 John of Deans Domestics who is the Managing director of Village Domestics Supplies Limited, started up his repair business in 1990 and prides himself on all of his repair work comes from word of mouth recommendation, he has not advertised for over 20 years. He has now taken on board James who works Monday to Friday (*including most bank holidays*) covering the following areas:Timperley, Altrincham, Hale, Brooklands, Sale, Ashton on Mersey, Lymm, Carrington, Wythenshawe, Gatley, Stockport, Bramhall, Hazel Grove, Stockport, Cheadle, Heald Green, Didsbury, Wilmslow, Macclesfield, Urmston, Caddished, plus many more. We generally cover a 20 mile radius from our showroom in Timperley Village. We aim to be as flexible as possible when making your service call whether that be a morning or afternoon call – or an all-day appointment with an hours’ notice, we will work around you to arrange the best possible time for your service call. If James or John call out to your machine and advise it is uneconomical to repair we charge a £20 call out charge, however, if you come back to Village Domestics Supplies Limited for your new appliance – where we have a price match promise you will get £10 of your call out charge taken off the cost of any replacement machine. If the machine is repairable we charge a £40.00 labour charge plus any parts that are needed to fix the problem – you will not be charged the £20 call out charge as well – this is only ever charged if there is no work carried out. If you would like one of our engineers to call out please contact 07989 348 667 – John or James can make you an appointment as the repair diary is dealt with directly from them - alternatively you can always call the showroom on 0161 980 1110 and we will pass the message on for you. What are the most common washing machine repair problems? Washing machines are a complex appliance as they perform many kinetic functions (washing, spinning etc) Whilst the causes for repair vary greatly depending on the model, age and usage volume, there are a few issues that are known to occur. Door clasps are known to become stuck and often need to be repaired and refitted. Damaged heating elements mean some appliances can't effectively clean clothes and we see lots of these. Loose drum bearings often emit a loud noise which causes concern among lots of people. Why is my oven not heating up? 9 times out of 10, this common problem is down to a heating element failure. The element may show signs of visual wear and tear (bulging, splitting or burning) or it may not. The good news is that replacing heating elements is a fairly simple task. If your oven has switched on but is not heating up, then give our friendly repairs team a call on 0161 980 1110. How much is appliance repair? We are unable to provide a set-in-stone price because again, this depends on the problem, the type of parts needed and the amount of labour needed to work on bringing about a solution. What we can guarantee is that our appliance repairs are aimed at offering real value for money and we seek to be as competitive as possible no matter the extent of the job! How do you decide between fixing an appliance or recommending the purchase of a new one? Making this call is an important one. If the problem is so severe that it requires expensive replacement parts and significant labour time, you may be able to buy a new washing machine for what the cost of the repair would amount to. We would have to diagnose the problem and assess the cost of fixing before making a recommendation. If you were to spend a considerable amount of money fixing a 12-year-old appliance, the machine as a whole wouldn't have the same level of durability that it did at the start. Whilst the immediate fault would have been dealt with, the rest of the machine would still be older and more prone to breakdowns. Will you be able to fix my appliance? With over 30 years' appliance repair experience and a team of skilled appliance repairs engineers, we have a high success rate. Further to this, our considerable time in the appliance repair/retail industry means we have great links to suppliers and manufacturers giving us access to the best replacement parts available. 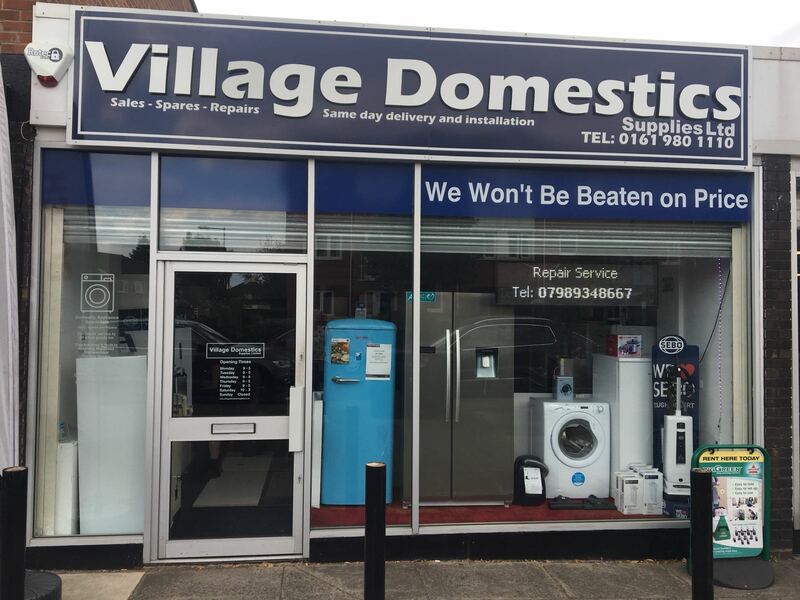 What types of appliances do Village Domestic Supplies repair? We can repair a range of freezers, fridge/freezers, washing machines, tumble dryers, dishwashers, microwaves, ovens, cookers, range cookers and more. How quick can you be with me? Depending on how busy we are, we can generally respond and arrive at your property that same day. We strive to make the process work around you and are generally flexible. Will my appliance be fixed same day? We'll come equipped with a number of tools and equipment to diagnose the problem. Depending on what needs replacing we may have to come back the next day if we have the part in stock at our showroom. If the part we need is very specific, we may need to order it from the manufacturer which can take a few days. Our showroom is based in the village of Timperley in Altrincham. We generally serve Timperley, Altrincham, Hale, Brooklands, Sale, Ashton on Mersey, Lymm, Carrington, Wythenshawe, Gatley, Stockport, Bramhall, Hazel Grove, Stockport, Cheadle, Heald Green, Didsbury, Wilmslow, Macclesfield, Urmston, Caddished and all areas in between.